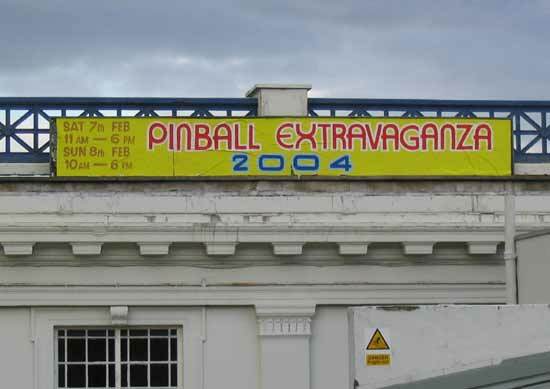 This was an important event for pinball in the UK because unlike many other countries, the UK doesn't have a regular pinball show. 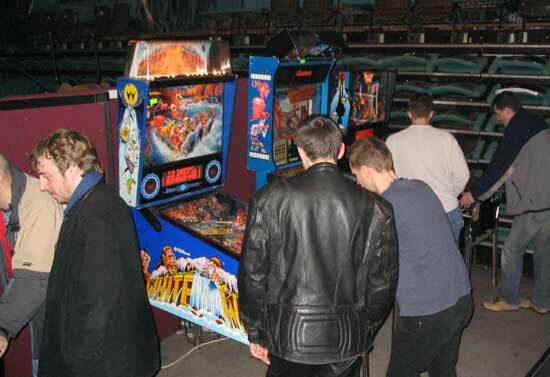 Pinball Extravaganza 2004 would reveal whether there was any demand for one. Would enough visitors turn up, would there be enough games to play and parts to buy? 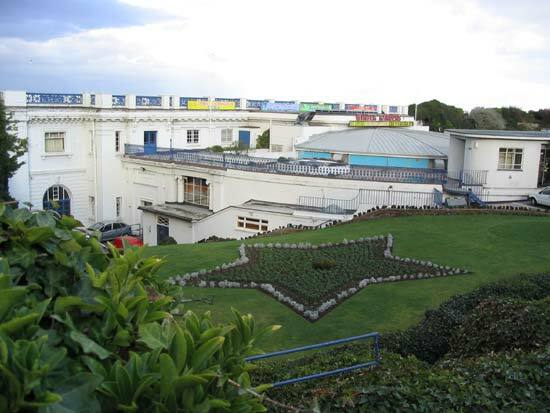 To find out, we traveled to Margate on the country's south-east coast and to the Winter Gardens. This venue is right by the sea and that leads to the first top tip of the show: Do not park your car next to the sea or you will come back to find it covered in a thick layer of salt mixed with sand. Even a bucket of water and a roll of paper towels from a local garage only managed to remove half of it from the windows. So, while it seems convenient, the side roads are a better place to park. With the six year anti-corrosion warranty put to the test, it's into the Winter Gardens to look at the show. The doors opened at 11am on Saturday but there was no queue and people just trickled in at the start, paying their £5 entrance fee for the one day or £9 for both. Coloured stickers were applied to clothing to show which option had been bought. 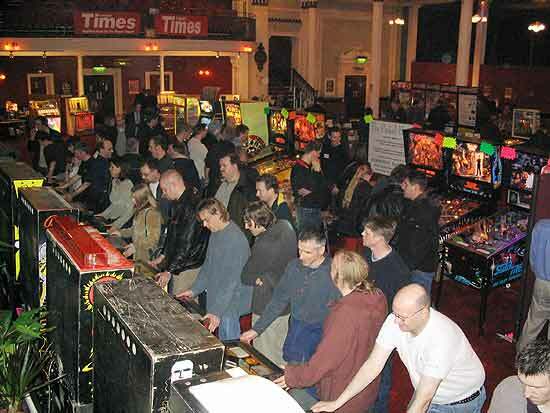 There was also a £3 fee to enter a competition where the prize was to be a pinball machine, but it turned out very few people were interested in this so that element of the show was scrapped. By midday on Saturday visitor numbers were good meaning most games were permanently busy, so more games would have been an improvement but you didn't have to wait too long to get a play. On Sunday there were fewer visitors leading to more vacant games. Ray Foster: Eight Ball Champ (Bally), Straight Shooter (Gottlieb), World Tour (Gottlieb), Totem (Gottlieb). Pinball Palace: Queen's Castle (Zaccaria), Radical (Bally), Hurricane (Williams), Phantom of the Opera (Data East), Pinbot (Williams), Elvira & the Party Monsters (Bally), Party Zone (Bally), Strange Science (Bally), Batman (Data East), Swords of Fury (Williams), Bone Busters (Gottlieb), Tales from the Crypt (Data East), Lord of the Rings (Stern), Medieval Madness (Williams). 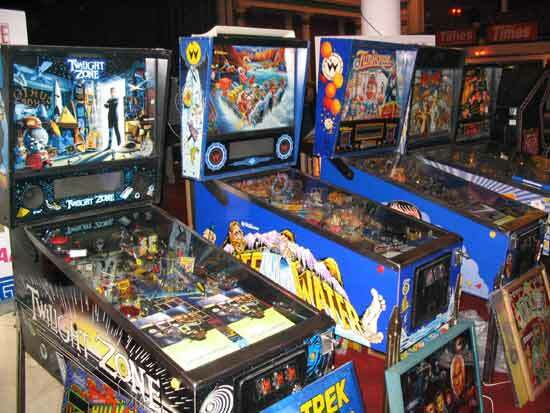 Pinball Heaven: Lord of the Rings (Stern), Indiana Jones (Williams), Medieval Madness (Williams), Twilight Zone (Williams), Star Trek - TNG (Williams). Pinballs To Go: Full (Recreativos Franco), Lucky Ace (Williams), Mini Golf (Williams), Flipper (Gottlieb), Orbitor 1 (Stern), Grand Tour (Bally), Hi-Score Pool (Chicago Coin), Majorettes (Gottlieb). Deco Pinball: Sky Kings (Bally), Tally Ho (Genco), Archer (Genco), Dexterity Play (Unknown), Airport (Genco), One-Two-Three (Genco), Circus (Genco). Arcade Warehouse: Twilight Zone (Bally), Whitewater (Williams), Funhouse (Williams), Dr Dude (Bally), Creature from the Black Lagoon (Bally). There were also several games provided by Andrew from Nottingham but I didn't see him during the show to get any more details: Revenge From Mars (Bally), Whitewater (Williams), Lights Camera Action (Gottlieb), Trio (Bally), Nip-It (Bally), The Addams Family (Bally), A.G. Soccer Ball (Alvin G). That makes 50 games in total. Of those, several were not playable for one reason or another. Arcade Warehouse had switched off most of their games with the exception of the Funhouse, while several others had no credits and were not on free play. This is understandable on older games where free play wasn't built into the system but owners often provide an alternative way to add credits such as a push button on the coin door or a really low replay score. Many of these games lacked that facility and required frequent topping-up of credits before they could be played again. 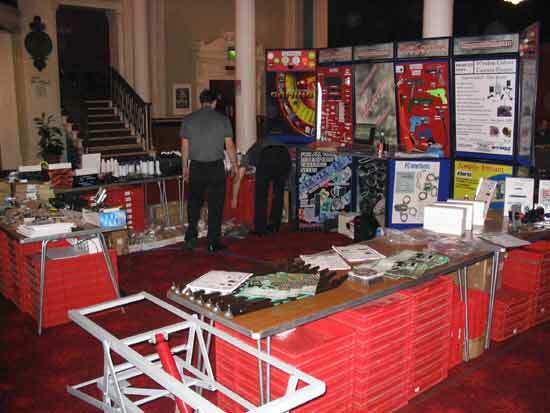 But the show wasn't just about pinball games - there were also plenty of spares available from Pinball Heaven and Happ Controls. Happ had brought along a good selection of parts, although none of them were priced forcing you to wait for a sales person and ask. They looked up the part number on a notebook computer. The time to do this made impulse purchases less likely. They did sell me a 64oz bottle of Novus No.2 which should last a lifetime. Most of the other parts I wanted were not at the show but could be ordered for later delivery and copies of their catalogue were available on CD. I headed back to Pinball Heaven for flasher bulbs and replacement balls before visiting Ray Foster to buy the last of his lamp sockets.Ray had quite a selection of parts, playfields, leads and coin doors on his stall. It was good to see PinLED at the event showing their low-voltage LED replacement displays. 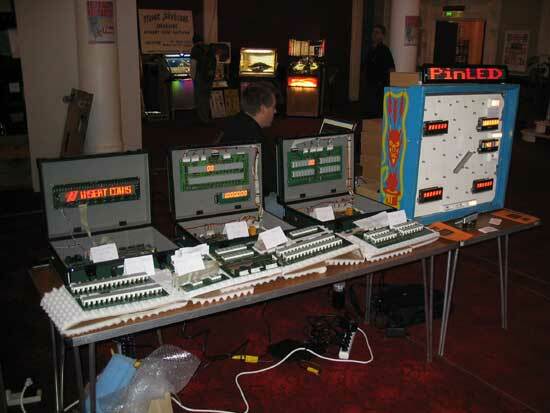 They had complete System 11 sets for £149 and Bally 6 or 7 segment boards for £33. Also on their stall (although not yet available) was their replacement 128x16 dot matrix display for Data East games. These could be pre-ordered for £189 but the model on the stall still showed some evidence of the "grid-effect" seen at Pinball Expo. Along with the pinballs there were several vendors selling jukeboxes, video games, slot machines, Allwins and other collectibles. Coin Action were selling various amusement machines including their MAME-based video game cabinets with 3,000 classic games installed and (being a PC inside) an MP3 player and Internet browser. 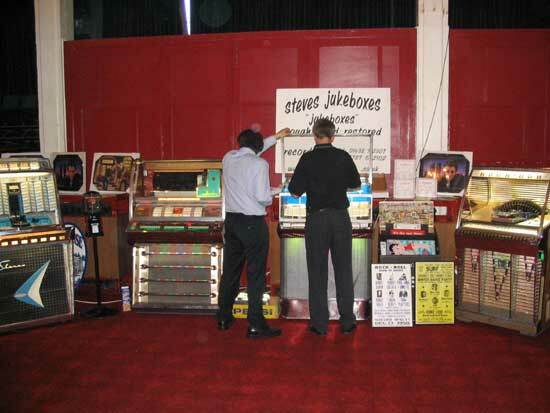 There were several jukebox vendors including Phil Cheeseman, Steve's Jukeboxes and Jukebox Parts. 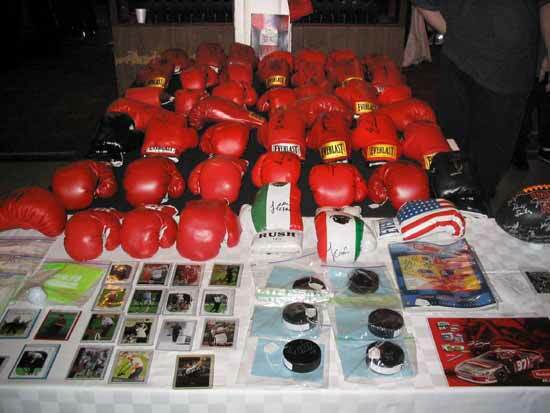 Perhaps the strangest stall was from Collectors Sports Bar who had a wide selection of baseball bats and signed boxing gloves along with baseballs, cards and a few pinball game EPROMs. 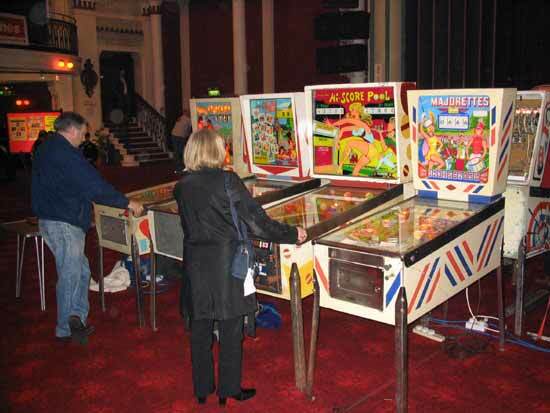 These non-pinball stalls helped to fill the hall and provide entertainment for the youngsters and non-pinball spouses. Speaking of the hall, the Winter Gardens is an excellent venue for this type of show. It is bright and airy with a snack kiosk and an adjacent bar with great views over the sea. The bar also provided a nice quiet area to relax with a drink away from the noise of pinballs and jukeboxes. The show received some welcome publicity when camera crews from the BBC and Meridian turned up on Saturday. I don't know if or when they ran the story but hopefully they did and gave pinball a welcome boost. Despite the lack of a competition on Saturday, I spoke to organiser Sean Mills and suggested that something be arranged for Sunday even if it was purely for fun. Happily, a high score competition appeared, played on a Medieval Madness placed on the stage. No entry fee was required and you could only play once, so there was only one chance to get that top score and win a trophy. 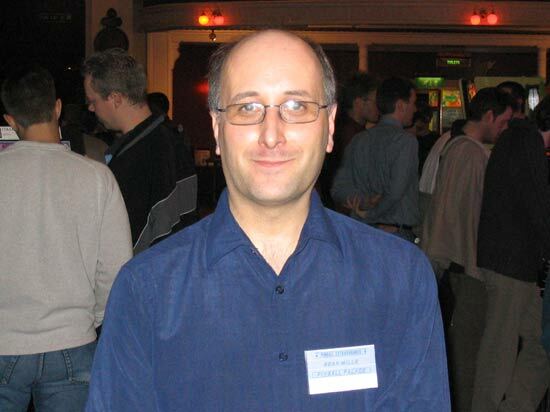 In the end, David Dutton won with a score of 96M points. 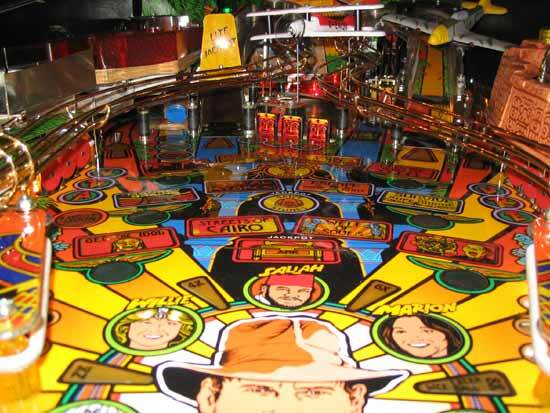 The best restoration of a pinball machine went to Phil from Pinball Heaven for his Indiana Jones. The best jukebox restoration went to Phil Cheeseman for his Seeburg 100. 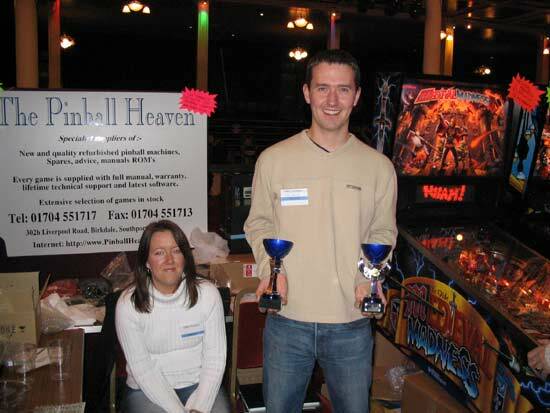 The rarest pinball award was won by Philip Crow and Peter Heath of Pinballs To Go for the Rally game Hairy Singers. 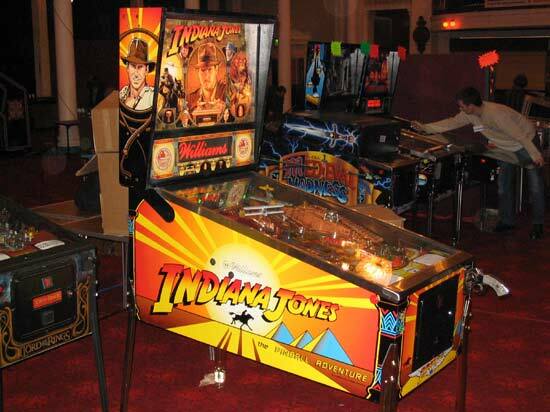 Finally, the award for best machine at the show was again won by Phil Palmer from Pinball Heaven for the Indiana Jones. I was asked to choose and announce the winner of best machine award and after examining and playing the IJ there was little doubt about the outcome. 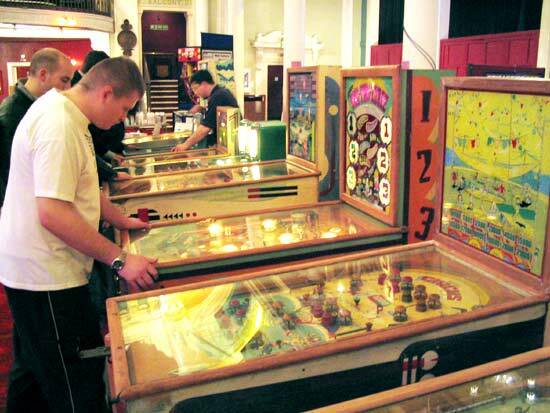 The playfield was immaculate even after two days' play and the cabinet had been renovated with new decals all round making the whole game look pristine. So Pinball Heaven went away with two awards for the game. Looking back at the two days of the show, it's time to answer those all-important questions at the top of this report; Would enough visitors turn up, would there be enough games to play and parts to buy? Visitor numbers were about right for Saturday but lower and slightly disappointing on Sunday. But it has to be remembered that this is the show's first year and apart from some local publicity, the show was only promoted by word of mouth and through Internet resources such as Pinball News. Hopefully, good reports of the show will appear and build the audience for future shows. Were there enough games to play? If they were all working and available for play, then probably yes. With up to a dozen out of action at any one time it would be nice to have a few more. I know several people who would have been willing to bring a game or two along, possibly to sell, but didn't want to pay the price of a stall. That would be a way to encourage attendance and increase the number of games. Were there enough parts? Yes, I think parts sales did well at the show. Many of those attending had their own games and so needed cleaning materials and spares. If the same companies appear regularly, buyers can pre-order and arrange to pick up their order at the show. For the vendors, game sales were quite varied. Some told me they had sold several games while others said they hadn't sold any and regarded the show as more of a showcase for their products and services. Sean Mills from Pinball Palace, the organiser of the event, appeared upbeat about the show's prospects. When I spoke with him late Sunday afternoon he said he was about to book the same venue for another Pinball Extravaganza next year and was choosing the best dates in consultation with the vendors. While a February show brightens up a generally dull winter in the UK, it is also traditionally a poor time for retail sales with the credit card bills for the Christmas and new year period becoming due for payment. If the show were a few weeks later, that situation might improve a little. 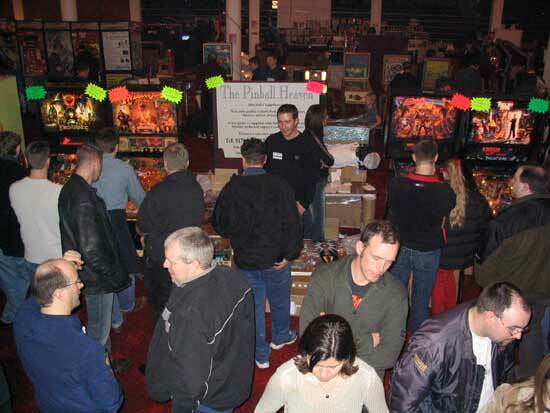 Ultimately though, Pinball Extravaganza has shown that there is still an appetite for a pinball show in the UK and that people will drive for 3, 4 or even 6 hours to attend one. It can be done and hopefully it will be again.